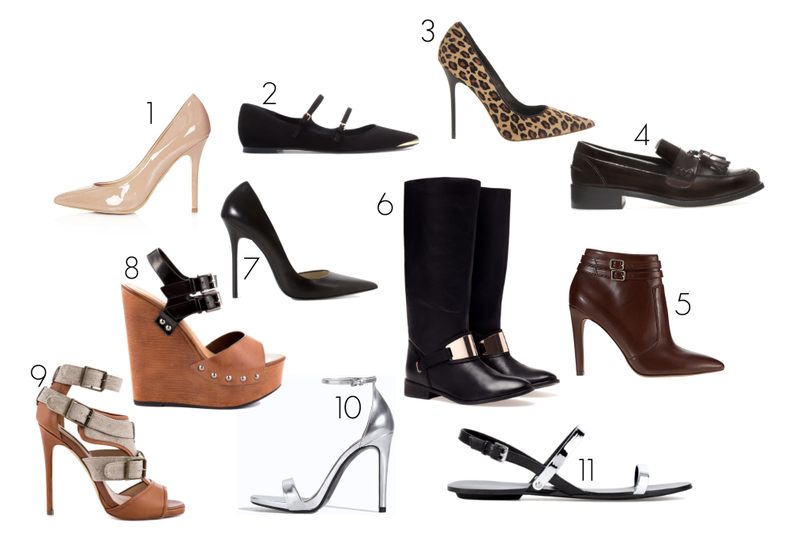 The Fashion Guide Blog : 11 pair of shoes every woman should have in her wardrobe. 11 pair of shoes every woman should have in her wardrobe. If you look at some fashion magazines, they often feature articles talking about the pair of shoes every woman should own. The thing is that most of them are really expensive and you might be outside your budget. That's why today I'm bringing you an update on some amazing shoes that won't break the bank! They don't have to be the exact model but the style of shoe. Have a look and have a great weekend!! 1. Skin toned leather pumps (Topshop) - 2. Ballet flats (Zara) - 3. Animal print pumps (Office.co.uk) - 4. Loafers (Zara) - 5. Ankle booties (Loft.com) - 6. Black city boots (Pull & Bear) - 7. Black leather pumps (Zara) - 8. Wooden platform sandals (Heels) - 9. Sporty heels (Heels) - 10. Metallic sandals (Zara) - 11. Flat leather sandals (Zara). Wow such a lovely shoe designs! I really like your blog. Now-a-days high heels fashions shoes are becoming a necessity for most of the women. It can change the whole personality of ladies. It is not only to increase the look of a dress but also accentuates our walk. Thanks for sharing with us such a wonderful blog. The war of clones part 8.